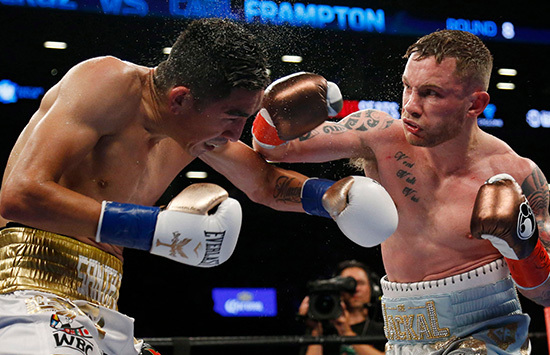 IT DIDN’T REALLYcome as a shock to Carl Frampton when his old adversary Leo Santa Cruz didn’t include him on his wish list following his victory over Abner Mares in June. The pair are all-square at one win each after they met for the WBA Super world featherweight title in July of 2016 and January of 2017. A decider has long seemed logical but the Californian-based Mexican has gone quiet on the matter and, in his post-fight rhetoric, it was the name of Gary Russell jr he was calling out for his next assignment. “Not really, although I am surprised he didn’t even mention me,” responded Carl when asked if he was disappointed not to get a mention. “There is not a lot I can do about that, he is his own man and I seem to be the only one talking about this fight anymore to the point where it comes across as a bit of desperation! Next up for Carl is a defence of his WBO interim world title and the fulfilment of a dream when he gets to box at Windsor Park in his home city of Belfast against Luke Jackson on August 18. However, settling the score with his old mate Leo will not stray too far from his thoughts until he gets the opportunity to make it 2-1. “I believe I am a better fighter than Leo Santa Cruz and I want to go and prove it. It is one-each and it makes sense for me. “Dan Rafael, the American boxing reporter, recently said Gary Russell and Santa Cruz is a bigger fight than myself and Santa Cruz, which I disagree with although I am not a champion at the minute and Russell is. “I feel the deciding fight in a trilogy is much more exciting than a Gary Russell fight. TUNDE AJAYI, THE charismatic mentor of the swashbuckling light heavyweight Anthony Yarde, is only too aware of the external eagerness to have the shackles swiftly removed from the 16-0 thoroughbred he is carefully nurturing the career path of. 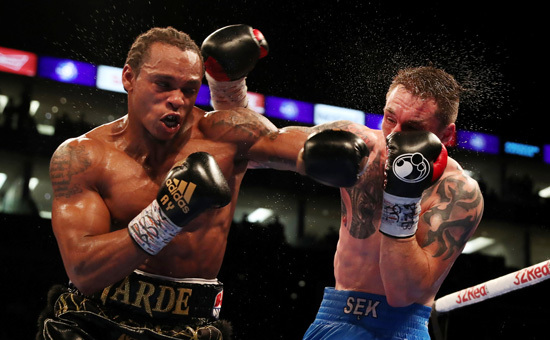 Anthony ticked another box last month by adding the defeat of a southpaw in the Pole Dariusz Sek to his CV, but the fact he is widely considered to be an exceptional talent brings with it the burden of expectation and a degree of impatience. Capable opponents who have provided stubborn resistance to many acclaimed fighters have been written off as cannon fodder by the online Twitterati, but Tunde insists he will not be diverted from the course which he feels is right for his power punching pupil. “To get to a certain level in any sport you have to be tough mentally,” reasoned the innovative trainer. “You won’t be swayed by the opinions of others. “I was saying to someone the other day to look at the career of Floyd Mayweather. It seemed like after he fought Arturo Gatti in his first pay-per-view people started talking and talking and negativity came in. “I always remember Floyd saying that the thing that separates him from the rest is that he was mentally tougher. “We just have to stay focused because Anthony has entrusted me to look after him in respect of his management and training requirements. Fighters take fights they shouldn’t take sometimes and then blame themselves. “Anthony wants to fight certain fights, believe me, while Frank has also tried to make certain fights, which is what people don’t know. “We know where we are going and we need to continue our course and continue the learning curve that I have in my head and everything is about timing. “Maybe because I have said he is special I have put pressure on myself. People say ‘alright, he’s special, so let’s see him have a fight’, but what happens when he fights the guys people want him to fight and he does the same thing to them? There is going to be another issue. “This is why you shouldn’t focus on the negative. We will continue to stay positive and we’ll see what happens. 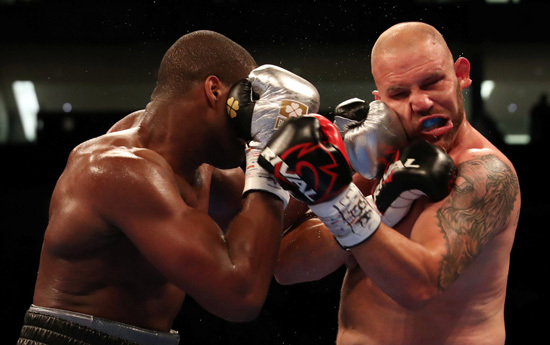 SPARRING STORIES ARE never in short supply in the fight game and Daniel Dubois’ last opponent Tom Little was not backward in coming forward with a few in an attempt to put the Peacock Gym protégé off his giant stride in the build up to their coming together at the 02. Little suggested that Triple-D curtailed a session with big Martin Bakole during his preparations – a claim that was refuted by both Bakole and his trainer when it was put to them. What Daniel does confirm is that he believes he undertakes the best sparring possible courtesy of the man from the Republic of Congo and now resident of Airdrie. The pair work together on a regular basis getting each other ready for fights and Daniel insists he gets to trade friendly fire with one of the top men in the business. “Yes because he is a potential world beater, a potential world champion,” stated the 20-year-old. “Really he is one of the best around who I could be sparring at the moment and we work well together. “We work hard, it is competitive and it is what I need to improve as a fighter.